Boost Mobile recently launched some new in store only promotions. Perhaps the most interesting is an offer for the iPhone 6 for just $29.99 to those who make switch to the Sprint owned prepaid brand. 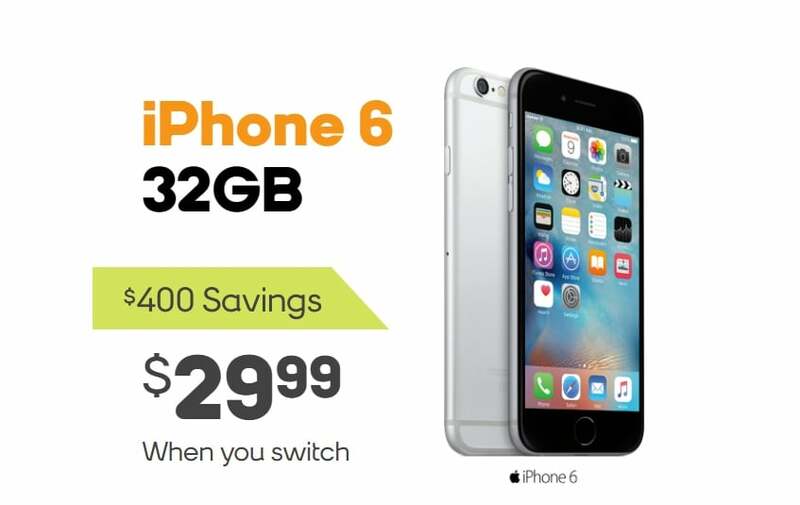 This bests a promo that Boost Mobile ran earlier this year when it sold the iPhone 6 for $49.99. Other hot new offers for switchers include a free LG Stylo 3, 4 lines for $100, and 4 lines for $120 with 30GB of hotspot. A limited time offer of an $80 "Ultimate Unlimited Plan" has also been announced. The company continues to offer a free month to switchers who bring their own device. The iPhone 6 will be available for $29.99 in stores only until 10/1/18 or while supplies last. The last time Boost Mobile offered a similar deal, it's end date got extended, so it's not out of the question that we would get an extension here as well. This offer is only available to new customers that port-in and activate on either the $50 or $60 unlimited plan or any unlimited family plan. The $50 plan includes unlimited everything with 8GB of mobile hotspot before throttling to 2G data speeds. Video streaming is limited to a resolution of 480p, music streaming is limited to 500Kbps, and cloud gaming to 2Mbps. The $60 plan includes unlimited everything with 20GB of mobile hotspot. Video streams at a maximum resolution of 1080p. For both plans, taxes and fees are included with the prices shown. Similar to other unlimited data plans on the market, a data prioritization policy is in place. Those who use more than 35GB of data in a month may have their speeds temporarily slowed down during times that Sprint's network is experiencing heavy usage. Both plans also normally include 50 domestic voice roaming minutes. However, those who take advantage of this iPhone deal will not get the roaming minutes. The $50 and $60 single line plans are available with multi-line discounts. Customers can add a line for $20 less than the cost of a single line and still qualify for the discounted iPhone. If you want to take advantage of this iPhone offer with the hopes of taking it to another provider, keep in mind that Boost Mobile won't unlock it for you unless it has been used on the network for 1 year. A new $80 unlimited ultimate plan has been announced. The plan will be available for a limited time only with an expiration date set for 8/31/18. This new plan includes unlimited everything with video streams at a resolution of up to 1080p, music at 1.5Mbps and gaming at 8Mbps. The unlimited ultimate plan is primarily aimed at those who require a lot of hotspot data. A total of 40GB of 4G LTE mobile hotspot is included before throttling to 2G data speeds. The plan also comes with unlimited landline calling to over 70 countries, 200 mobile minutes to over 50 countries plus unlimited international texting. A subscription to Tidal premium is also included. Boost Mobile says that those who subscribe to this plan will get priority customer care which will allow access to an "elite live agent." Additional lines of service can be added to the plan for $60/month. The same 35GB data prioritization policy applies as it does to any other Boost Mobile unlimited plan. The LG Stylo 3 will only be available for free to new customers that are porting-in. Subscribers must activate on either the $50 or $60 unlimited plan. The phone will be available for free until 10/1/18 or while supplies last. Customers are responsible for paying taxes on the device which regularly sells for $99.99. The iPhone 6 offer is a really good deal. However, for just $20 more, shoppers can opt for the newer iPhone 6s from MetroPCS which is available to switchers for just $49. The new $80 plan is an interesting price point and I'll be interested to know how it sells. It's basically encroaching on what can be considered standard carrier pricing. In fact it is more expensive than Sprint's two unlimited plans which include the $60 unlimited basic plan and the $70 unlimited plus plan. Boost Mobile's $80 plan is most similar to Sprint's unlimited plus plan. However, the Boost plan actually includes more hotspot data, 40GB as opposed to the 15GB that comes with the Sprint plan. The Sprint plan however includes both roaming in Mexico and Canada. In addition to a Tidal music subscription it also includes a subscription to Hulu and better coverage thanks to roaming access. Sprint does charge taxes and fees. I think people generally like prepaid service because it's cheaper, there are no credit checks involved, and generally no contracts. It can be argued that there is a little bit of overlap between Boost Mobile and Sprint here, so we'll have to see how this all shakes out going forward. According to Jeff Moore from Wave7 Research Boost Mobile likely started off July with weak sales. All these new promotions were likely put in place to jump start quarter 3's slow start. So I like the iPhone 6 deal however there’s a catch to it. Switching your service provider won’t get you the iPhone for $29.99 as stated unless you are eligible. Boost will check the given number, if it hasn’t been activated and working for at least 120 days, then you won’t be able to qualify for the promotion. I called Boost mobile and they stated “ As long as you have a active phone number, you can get the iPhone “ and that just isn’t the case. I’m not sure I follow. If you have a phone number that hasn’t been activated for over 120 days you don’t have a service provider to switch from. You’re not switching providers, you simply don’t have one.